Back in the mid-1970s, probably before I was quite 21, my pals and I crawled into a hopping little honky- tonk way on the south end of Cerrillos Road called the Bourbon & Blues. At least, it was considered way south back in those days. Playing that night was a couple — a blind couple — from deep in the heart of Texas. Nobody I knew had ever heard of them before that night. But somehow they packed the place. They played a lot of country classics, a bunch of Jerry Jeff Walker songs. The dude in the thick glasses and Hoss Cartwright-sized cowboy hat flat-picked his guitar with unassuming grace, while his wife’s piano sounded like something from some archetypal Old West saloon. The beer flowed that night at the B&B, and the dance floor was no place for claustrophobics. I believe everyone left the place that night a fan of Bill and Bonnie Hearne. In 1979, the Hearnes moved from Texas to Red River, where they made a living playing for ski crowds. After more than a decade there, they moved to Santa Fe and quickly became a fixture. Now Bill Hearne is the undisputed king of country music in Santa Fe. He’s releasing a new CD, All That’s Real, which, like most of his recordings, I can’t listen to without drifting back to that first appearance at the Bourbon & Blues. Bonnie, who has been retired for several years due to medical problems, even sings on a couple of songs. 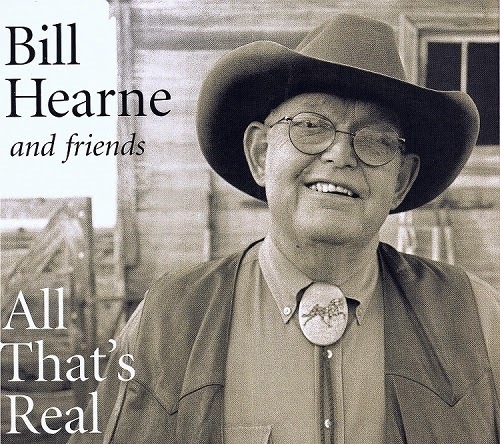 All That’s Real is co-produced by Bill Hearne and Don Richmond, a master of many stringed instruments who lives in Alamosa, Colo., but has many musical cronies in Northern New Mexico. Numerous area pickers and singers perform on it, as well as some notable Texans, including piano man Earl Poole Ball (best known as Johnny Cash’s piano player, though he also played on the Byrds’ landmark country-rock album, Sweetheart of the Rodeo), and Jerry Jeff Walker, who sings his own “Dust on My Boots” with Hearne. Hearne never has claimed to be a songwriter, but he’s got a knack for taking others’ material and making those songs his own. On the new record, he draws from some familiar sources: Guy Clark, Lyle Lovett (Hearne has shared the stage in Santa Fe with Lovett, a fan of Bill and Bonnie since he was a kid), Delbert McClinton, and Gordon Lightfoot. There are so many highlights here, it’s hard to know where to start. The album starts with a Clark gem called “Rita Ballou” (“Hill country honky-tonkin’ Rita Ballou/Every beer joint in town has played the fool for you …”). Both McClinton numbers — “Ruby Louise” and “Real Good Itch” — are among the best on the album, both having a roadhouse rock ’n’ roll edge. Bonnie Hearne sings harmonies on “Real Good Itch” as well as “One of These Days,” a tune best known for Emmylou Harris’ version. I wouldn’t have complained had Bonnie sung lead on that one. My very favorite Hearne songs have always been the hard-core honky-tonkers. On All That’s Real, he does a crackerjack cover of a true touchstone of the genre, “City Lights,” which was written by “Whispering” Bill Anderson but is most associated with Ray Price. When I saw that this album had a version of Leonard Cohen’s “Bird on a Wire,” my first thought was that this might not be the best tune for Hearne to tackle. Fortunately, though, he sings it with soul. The song is aided by Richmond’s pedal steel and Taos rocker Jimmy Stadler’s organ and piano. All That’s Real makes me proud the Hearnes made Santa Fe their home and nostalgic for the glory days of the Bourbon & Blues. The official CD release party for this album is scheduled for 7:30 p.m. Oct. 28 at La Fonda, where Richmond joins Hearne onstage. If you can’t wait, Hearne plays Saturday, Oct. 18, at the Cowgirl BBQ; Monday and Tuesday, Oct. 20 and 21, and Oct. 27 at La Fonda; and back at the Cowgirl for a solo happy-hour gig on Oct. 24. * Joe West’s Theater of Death. If West only concentrated on writing, performing, and recording his songs, he’d still be pretty darn remarkable. For well over a decade he’s been my favorite singer/songwriter from these parts. But West’s spirit is a restless one. In recent years he has expanded his game, slipping the surly bonds of genre and medium, experimenting with time-traveling trans-vestite rock opera, avant-garde radio, and, of late, the stage. Last spring he created a dramatic ensemble called Theater of Death and performed a series of dark, one-act plays at Madrid’s Engine House Theatre. This shouldn’t be a surprise, considering that West started out in the theater years before he became a professional musician. And now, with a group of musical conspirators, he has recorded an eight-song extended-play album of tunes from that show. Three of the selections are titled “Zombie Jam.” They’re sinister-sounding instrumentals — mostly blues and spook-house jazz — the first of which includes some bursts of sound collage and fake newscasts. A song called “La Llorona” has Busy McCarroll singing in Spanish and “Rien Rien” features Lori Ottino singing in French. And there’s a phony radio ad for snake-oil patent medicine. 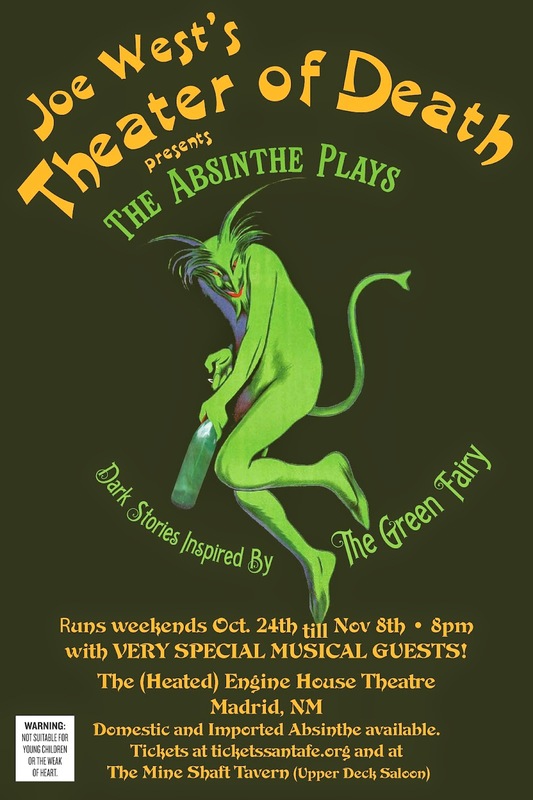 This EP will be sold at the upcoming performances of the new Theater of Death production, “The Absinthe Plays.” These are on Oct. 24 through Oct. 26, Oct. 30 through Nov. 2, and Nov. 7 through Nov. 9 at the Engine House Theatre, 2846 N.M. 14 in Madrid. The show starts at 8 p.m. except on Sundays, when curtain time is 3 p.m. Tickets are $20. And here's some Joe Wet & The Santa Fe Revue singing an old favorite, "Are You Still My Girl" at the Outpost in Albuquerque in 2012.